A comedic legend once said “a house is just a place to keep your stuff”. While partially true, a house can be so much more than that. It’s a place to live, a place to have fun, and a place to sleep at night. It can be old or new, priceless or rented, or anything in between and still feels like the best place to be. A house is a home and with it comes lots of responsibilities. Owning a house is great, but there can be a lot of problematic occurrences that may happen, especially if the house is older. These sorts of things can happen at any moment’s notice and can put your belongings and health at risk. One of these things is common household molds. These molds can range from mold that grows on bread to the harsh, life-threatening black mold that many fear. There are ways to prevent mold from growing in your house and can be quite simple at times. However, if it does happen, it can be a nightmare to exterminate it. If it’s not all removed, it has a very high chance of growing back. If you do find mold in your house, it’s always wise to call a professional to get rid of it, considering most people aren’t equipped to eradicate it completely. How do we know this? We've been dealing with mold remediation in Orlando for over 15 years as a state licensed mold remediation and disaster restoration company. We've worked on many homes where the homeowner thought they had it under control, cost them even more than if they would have called a professional in the first place. In order to get rid of anything in the most optimal way, one must know everything about it. Mold is, at its core, a fungus. It’s not like the mushrooms you know, other than it can spread relatively quickly. Dampness and dark, insulated areas are where mold thrives. If there’s any sort of dampness in a room, you can be sure that mold will likely flourish. Keeping areas as dry as possible will stifle mold growth, whether it’s normal every-day mold or toxic black mold. Some people are very allergic to fungus and mold, and these sensitive reactions can cause fatigue, agitation, sickness, and in some cases, death. If these molds infect your house, it’s also possible that you could lose everything you have. There are hundreds of variations of mold throughout the world, but there are only a few that can be commonly found in homes. All of these can be detrimental to health, even if you’re not sensitive to allergies or infections. Remember, unless you remove every spore of mold, it has the possibility of growing back, so be sure to get a professional involved. While there are hundreds of species of molds out in the world, there are only about five that make their way into your home that might be detrimental to you and your health. Five doesn’t sound like a lot, but they can certainly make you sick as easy as anything. If you find any of these in your home, you may have to get a professional out as soon as possible. 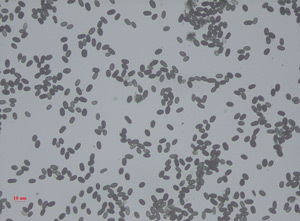 This common household mold is mainly found as a plant pathogen. It often triggers allergic responses in humans and can easily grow indoors to cause hay fever, hypersensitive reactions, and sometimes asthma. About 20% of agricultural spoiling is because of this mold and can cause many health disorders—it can grow on your skin, mucous membranes, and respiratory tract. If you have been exposed to garbage and soil, there’s a possibility of getting an alternaria infection. The visual properties of this mold are a small tuft which is velvety. It has long hairs that range from brown to dark green. It is usually seen growing on spoiled food, though is more likely to be found along window sills and moist, damp places. If you see any food with this green fuzziness on it, be sure to throw it away. Don’t eat it! This mold thrives in warmer climates. Its best areas are high dampness or water-damaged items or locations. 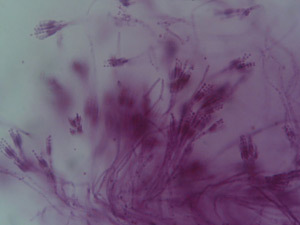 This is one of the molds that release mycotoxins, which are similar to those of “black mold”, which is discussed later. Mycotoxins are known to cause diseases like pneumonia, aspergillosis, aspergilloma, and sometimes respiratory failure in humans, especially those sensitive to mold. 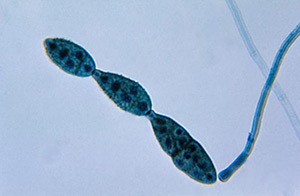 Aspergillus assists in breaking down dead cells, assisting in making alcoholic beverages, and some species are a larger source of citric acid for food preservation. It grows in circular patterns, but can be found in rotting items or in AC units or flooded houses. 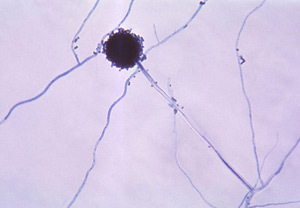 While having hundreds of species itself, Cladosporium is a genus of fungus that is normally found outdoors. It can, however, be tracked indoors through people or ventilations like air conditioners or HVACs. While rarely affecting humans, it has sometimes caused infections to toe nails, sinuses, lungs, and the skin. Those with asthma may be more sensitive to it. 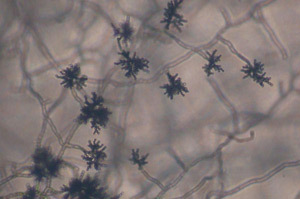 While not normally found inside, this mold grows in circular patterns. It usually has brown edges with a green middle, but can be dark brown or black at times. They are occasionally found on leaves, making brown spots along the green. This is one of the most common molds that cause human allergies to act up. Some of these species can produce mycotoxins, which can cause dangerous diseases in humans and animals. It can cause certain kinds of bacteria, good or bad, to stop growing inside the body and is used to make penicillin and cheesemaking. Also among the main causes of food spoilage, it is present in air and dust inside homes and buildings. This is the kind of mold you often see on bread or cheeses. It looks white along the edges and a pale sea green or blue along the middle. Possibly one of the more dangerous molds of the common ones, stachybotrys, or “black mold”, is becoming more prevalent in today’s society. Black or dark green in color, the mycotoxins that it produces are hazardous to humans. It is one of the most active molds and can infect much of your possessions to the point of having to throw them out. Symptoms of black mold can include asthma-like effects. There is also fatigue, skin tingling and numbness, chronic cough, and even abdominal pain and diarrhea. If you feel like you’ve been drained of energy constantly through the day in your house, it might be time to go see a doctor. Mold is a very serious thing and can cause lots of harm, especially to those with allergies or those that are sensitive to mold. Some of these molds release mycotoxins, which are toxic to humans and can inspire asthma-like symptoms and can even kill. If you’re unsure if you have mold or not, call a mold specialist or mold professional. They know what to do and can get rid of it for good. While mold removal can be expensive, you wouldn’t want to subject you or your loved ones to mold toxicity. These five common household molds alone can make you and your family miserable and even depressed. Keep yourself healthy by cleansing your home, your body, and everything around you. You’ll have a better life in the long run.